Butter is a spread made from solidified cream. 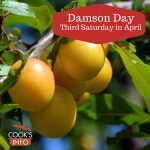 It can be used at the table as a “condiment”, or in the kitchen as an ingredient. To make butter, the fattier part of milk called “cream” is taken from the milk, and then churned. Eventually globules form, and start to clump together. Two products result at the end: the globules which form a mass, called butter, and the liquid left over, which is called “buttermilk”. Salt is often added to butter. The purpose used to be to act as a preservative, slowing down the growth of bacteria in the butter; today, it is added mostly as a flavouring for those who are used to or prefer the taste of salted Butter. Sweet Cream Butter is unsalted butter. It is common in Ireland, England, New Zealand and North America. Cultured butter (made from cream to allowed to stand for a day with starter cultures in it) is common in Europe. North American butter by law must have a minimum 80% butterfat in it. In Canada, most manufacturers only supply the bare minimum legally-required 80% butterfat in their butters. Higher butterfat-content butter can be critical in chocolate and pastry making, because it means less water in the product. Speciality American butters and everyday European butters tend to start at 82% to 83% and can range up to 86% butterfat. 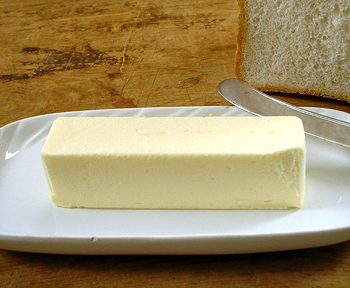 It takes 5 litres (10 US pints) of milk to make 225 g (1/2 pound) of butter. Butterfat is the fatty part of milk that is used to make butter. It takes about 100 pounds of milk to produce 3.6 pounds of butterfat, though in some herds that amount is increasing to 5 pounds owing to better selective breeding. To separate butterfat out of milk, pasteurized whole milk is whizzed around in separators rotating 30,000 times per minute, separating off up to 40% of what is called Butterfat Cream. The churning process breaks down a membrane around the butterfat molecules, allowing them to adhere to each other, thus coagulating to form butter. Butter forms in the final two minutes of the churning process. The leftover milk (the “buttermilk”) is drained from the churn, then the butter is washed with water to remove any residual milk — the proteins in the milk would shorten the life-span of the butter. If you use salted butter in your cooking, then you may wish to cut back a bit on any salt called for in recipes. Don’t substitute oil for butter for in a pastry recipe. It is okay to do so in most recipes for cakes and muffins. In North America (though more easily in the States than in Canada), you can buy Butter in stick form — long rectangles about an inch (2.5 cm) on each side. The sticks are individually wrapped, and are in a box, 4 to a box, with each stick weighing 1/4 pound (115 g) and the entire box therefore weighing a pound. A knob of Butter is, at best, an inaccurate measurement that really means a “dollop”. While certainly, some people maintain that a “knob” is around 2 tablespoons, there are as many folks that maintain that the closest measurement to a “knob” is about 2 tsps. Another definition for “knob” of butter is the amount of butter you get when you slice the corner of a block of butter to form an isosceles right-angled tetrahedron equal to half the height of the block of butter. This averages about 2 tsps. You can freeze Butter. Leave it in its package, wrap it well with tin foil or place in a freezer bag, and freeze up to 3 months. In eighteenth century colonial America, pitchers of melted Butter were sometimes placed on the table to pour over your dinner as a sauce. Welsh Butter has traditionally been quite salty. The cow herds there produced great surpluses of milk, which meant surpluses of Butter that needed to be preserved for a longer time. Salting the Butter well was a way of doing this. Even though the milk surplus days are over, the Welsh still retain a taste for salty Butter. The first commercial creamery in America to make Butter started business in Iowa in 1871. The American Congress decreed in 1923 that American Butter must have a minimum 80% butterfat in it; that law remains unchanged today. A firkin of butter was 54 pounds (24 1/2 kg) in weight. I need not tell you how to make Butter, since there are very few in the Country that can be ignorant thereof; wherefore I shall only say, that the best time to pot your Butter is in the Month of May, for then the air is most temperate, and the Butter will take Salt best; however, it may be done at any time betwixt May and September. In preserving thus your Butter, you may not only supply your House therewith, but to your profit furnish others.” — Hannah Woolley. The Gentlewomans Companion. London. 1673. “Just imported from Rotterdam, a large quantity of excellent DUTCH BUTTER of a fine straw colour, the produce of the most esteemed Dairies in Holland, and of so exquisite a flavour as cannot fail to gratify the most delicate taste. The butter being put up in small packages (from 12 lb. to 28 lb. and upwards) renders it very convenient for the use of small families. By the same ship, a quantity of DUTCH RUSKS, sold in casks, and by the pound.” — Advertisement placed by “The Italian Warehouse in The Edinburgh Advertiser. Edinburgh, Scotland. Friday, 26 December 1823. Page 1. “With respect to the prices of butter, it appears by the household-book of Lord North that a pound of butter in the reign of Queen Elizabeth cost fourpence: at the present time (the summer of 1835), a pound of the best butter in the west of England costs from sevenpence to eightpence, while in the metropolis the price is fourteenpence. A large portion of the butter consumed in London is in rolls without any impression. Dutch and Irish butter is also imported in considerable quantities, but the flavour and quality are not considered equal to the butter of this country; and the Dutch butter often abounds with hairs and other impurities.” — The Penny Magazine. Volume 211, 18 July 1835. “In America today we are asking what is to become of us if we cannot have butter to eat! Such are the fashions in food. ‘June butter’ is one of our gastronomic traditions. The sample in the restaurant may have none of the firm creamy texture and delicate aromatic flavor of the product of the old spring house; but as long as it is labeled butter we try to bring our sensations into line with our imaginations.” — Rose, Mary Swartz. Everyday Foods in War Time. New York: Columbia University. 1918. From Kindle edition, 2012-05-16. Page 21. Schultz, E.J. Butter’s Back — Sales Rise as Consumers Seek Pure Ingredients. Advertisg Age. 26 June 2012. Prince, Rose. Delights of dairy: We all need buttering up. London: Daily Telegraph. 12 March 2009.